Deleted forms are recoverable for 7 days. Restoring forms also restores results and attachments that were present when the form was deleted. Forms appear on the My Forms page in the forms list. 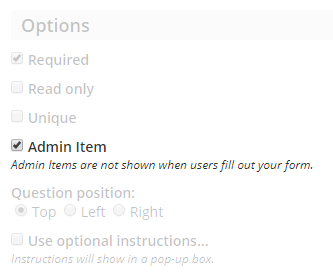 This list allows account users to edit the form items, settings, and results through the form’s links. The icons show how to add forms to a folder, copy the form, and delete the form. 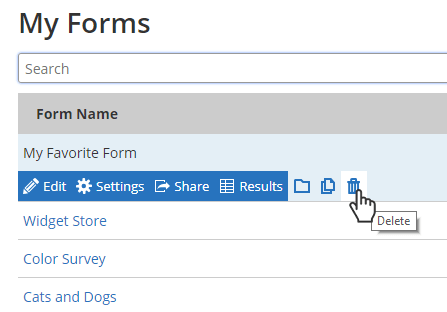 Clicking the delete icon sends the form to the Deleted forms folder. 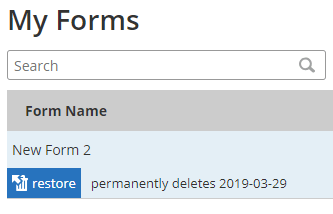 For 7 days, the form and its results will remain in the Deleted forms folder, after which time it’s permanently deleted. Only forms that are recoverable appear in the list. If the form does not appear in the list, it is not able to be restored. Changed or deleted form items: Deleting or changing form items is instant and permanent. Changing the form items with results in the Results Table may also change the results. Deleted results: Deleting results is instant and permanent. Be sure to export the Results Table before editing the form if the form contains saved results.